With equities closing lower for the second consecutive day, the VIX managed another net daily gain, settling +10.4% @ 31.40 (intra high 33.82). 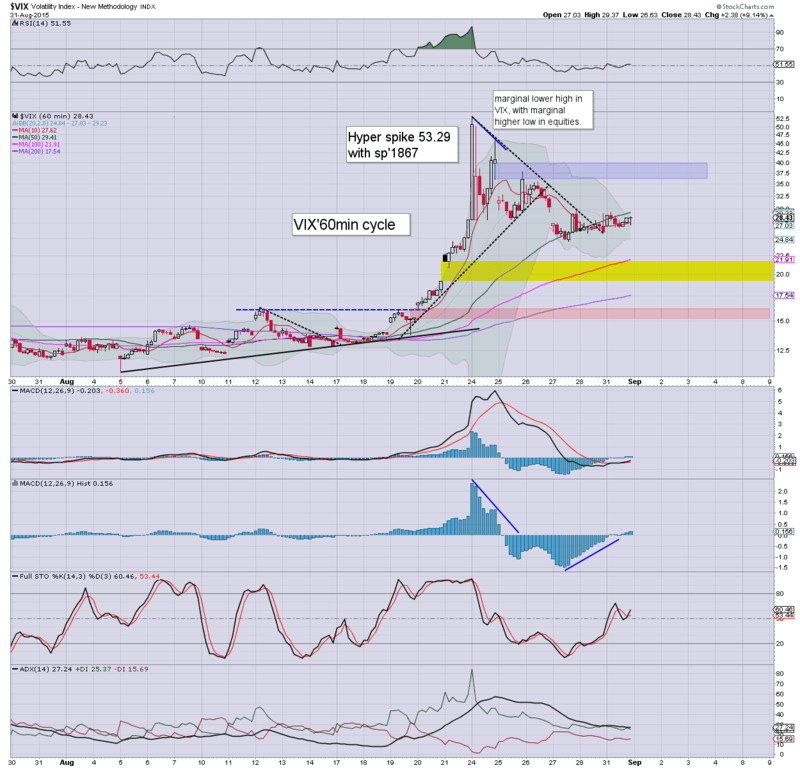 Near term outlook is for renewed equity upside, which should see the VIX cooling back to the low 20s. *note the daily closing candle.. a black-fail doji, which itself is a reminder than the VIX saw an opening hourly black-fail candle. 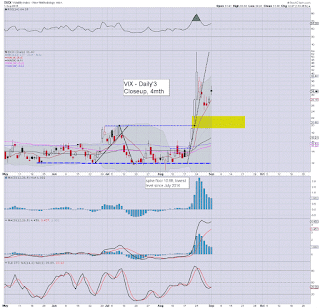 VIX certainly continues to reflect a market that is regularly seeing powerful swings. All things considered, price structure IS a large bear flag, and does bode for further VIX cooling, with equities having upside back above the sp'2000 threshold. 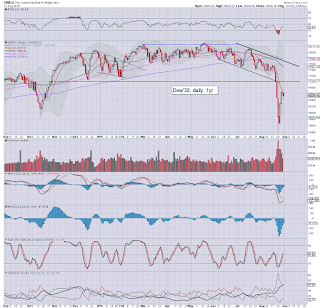 US equities closed significantly lower, sp -58pts @ 1913 (intra low 1903). The two leaders - Trans/R2K, settled lower by -2.1% and -2.7% respectively. 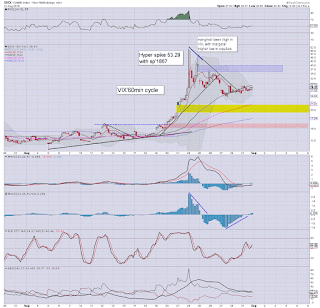 Near term outlook is for renewed upside, at least to the sp'2000 threshold.. with VIX cooling to the low 20s. *closing hour.. very weak price action.. new lows.. as also reflected in the VIX which broke into the 33s. First, I realise the idea of 'renewed upside' from here seems absurd.. but then... wasn't a retrace from 1993 to the 1945/30 zone last Friday? This could easily just be Mr Market trying to washout the maximum number of bull maniacs, before the next lurch higher.. based on nonsense talk from Draghi (Thursday) and/or Goldilocks jobs data (Friday). *yours truly is now underwater in a moderately sized AAPL-long position. Not a great day, but then... I was in much the same situation last week.. and that worked out okay. US equities remain significantly lower, and regardless of the exact close, it has been a second consecutive day in favour of the bears. There has been sustained downward pressure, as reflected in the VIX.. back in the 31s. 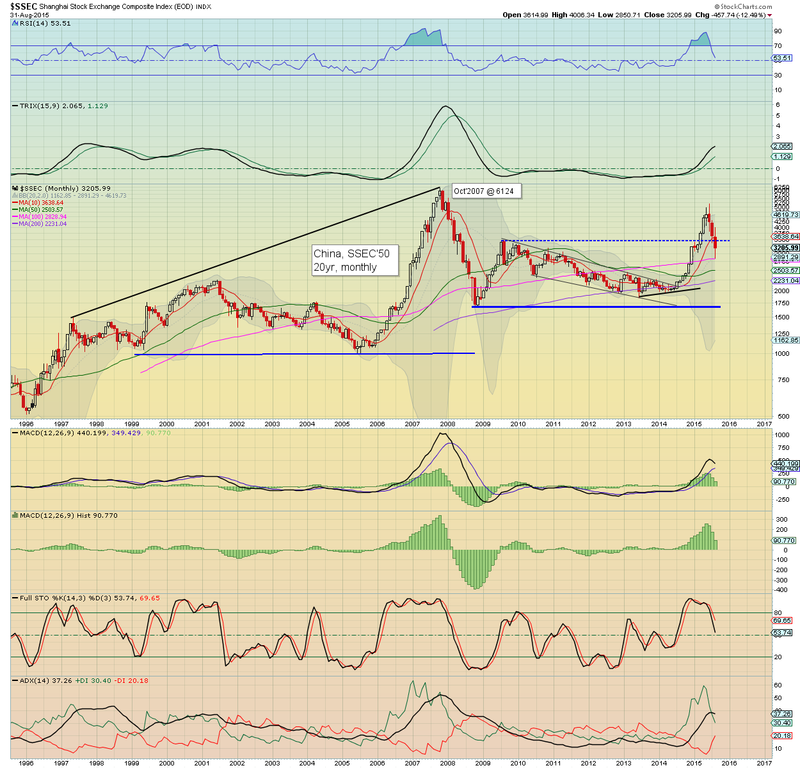 Broadly though, renewed equity upside looks due.. at least to the sp'2000 threshold. 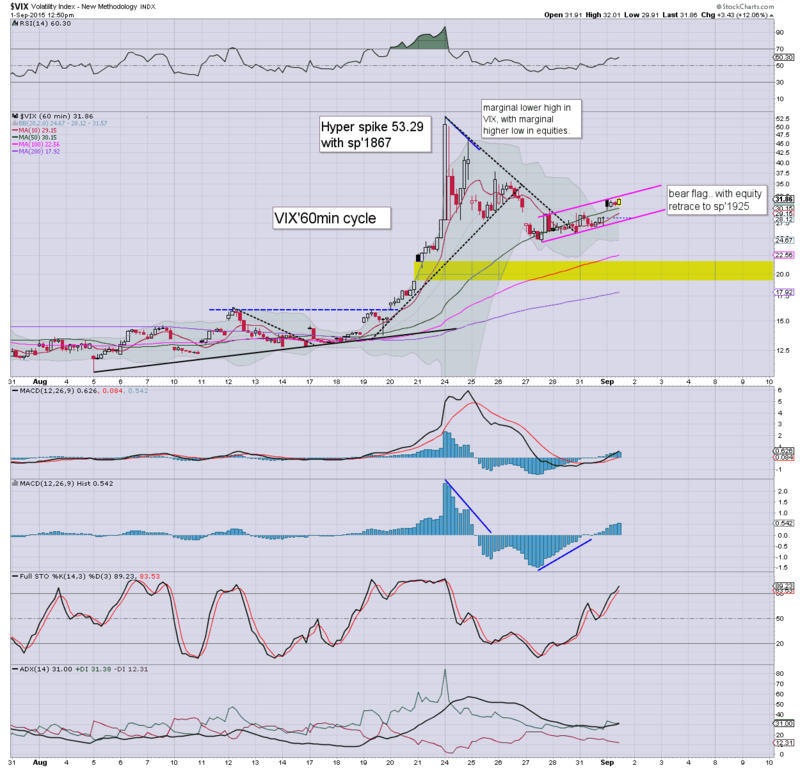 *price structure on the VIX hourly remains a large bear flag, and I will be rather surprised if the VIX does not cool lower to the 20 threshold within a week or two. 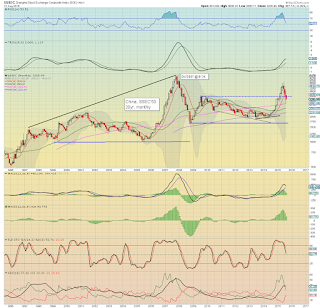 So.. we're still sig' lower, and I realise many will be seeking a break <1900 tomorrow/later this week.. but for now.. I'm guessing the move from Friday to today was a simple (if somewhat powerful) retrace of last weeks 126pt hyper-ramp. updates into the close... not least if we see a major snap higher... or lower. 3.22pm Price action sure isn't pretty, and there is no sign of a turn... indeed, there is no threat of another minor wave lower into the close. The bulls face a problem in that we're going to settle just 1% or so from 1900 threshold.. and if 1900 fails to hold... then 1867 is next... but equally viable.. 1820. Can Draghi rescue things this Thursday, or will he seal the markets fate? 3.33pm.. sp -57pts @ 1914... and right now. still zero sign of a turn. VIX confirms the new lows, +14% in the 32s. Stray thought.. China.. will the leadership come on out again and start buying? 3.48pm.. micro jump from 1903 to 1912.. but really.. it is a train wreck of a close. 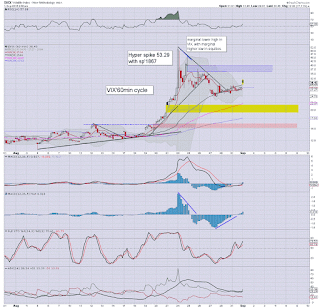 The threat is now an overnight gap lower.. straight through 1867.. and to 1820... tomorrow. 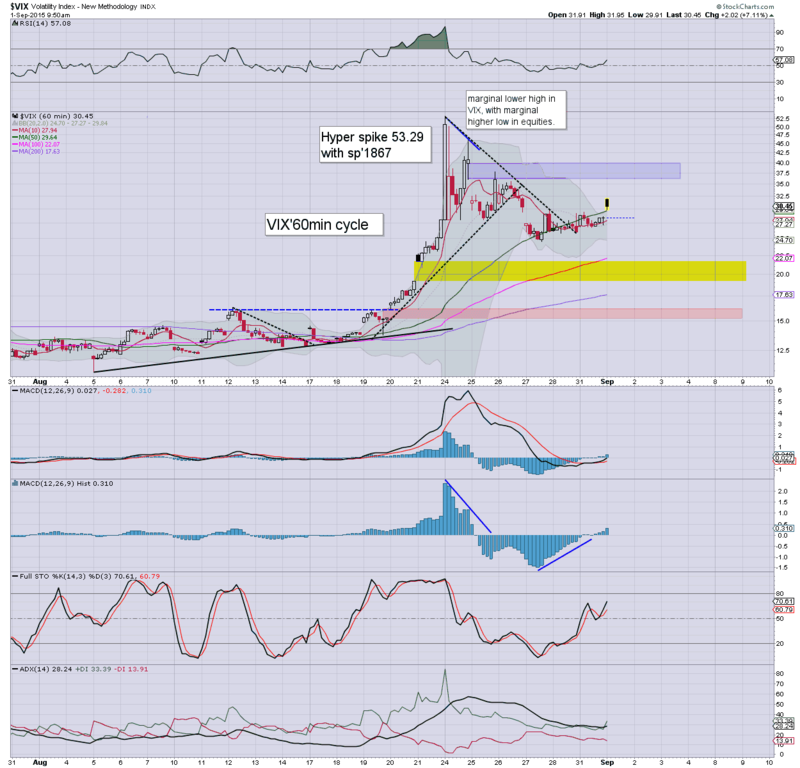 With the market seeing a new retrace low of sp'1918 - with VIX 32.50, the bull maniacs in the mainstream are no doubt somewhat rattled. From a pure cyclical perspective though, the market has rather easy upside to the 1930/40s by the close. Well, at least it ain't boring. 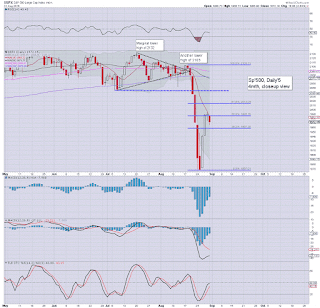 After a rather subdued Friday and Monday, we're back to the wild swings... having broken quite a way below what I thought was a bold target of sp'1945/30. Broadly, I'm still on the 'rally into mid Sept' train. *I remain long-AAPL, but its a small size position, and I'll sleep easy.. regardless of the close. Seeking an exit in the 115s, which frankly still looks very probable. US equities have decisively taken out the morning low, sp'1920 - with VIX 32.07. Despite the failure of the earlier low to hold, the bigger hourly/daily cycles remain on the low side, and the setup does not favour the bears. The Draghi remains an obvious threat... along with a very possible 'Goldilocks' jobs number. Well, my 12pm post title is now looking somewhat ironic.. but still.. from a pure cyclical perspective, we're on the low side, and would be bemused at anyone who is still holding short. Despite the new high, VIX remains within a large bear flag... the 20 threshold remains target. 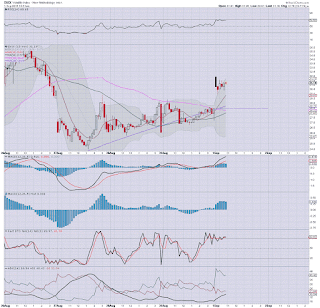 Were I not in 'trading light' mode, I'd consider shorting the VIX from here. notable weakness: NFLX -8% in the $105s. 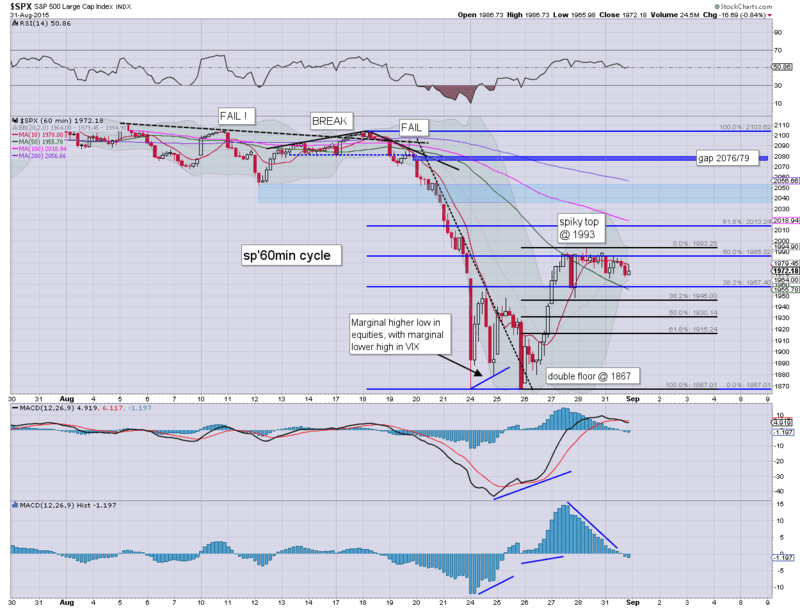 US equities are solidifying a retrace floor of sp'1925... with the market set for another very significant up wave of 5-6% to the sp'2050/70 zone.. along with VIX cooling to the 20 threshold. Once we get past mid Sept' though... things could get real wild on the downside. *note the bear flag on the VIX cycle. Overall, it looks a straight forward floor building phase.. before pushing back upward. Whether the excuse is Draghi (ECB meeting) on Thursday.. or 'goldilocks jobs' on Friday... it really doesn't much matter. We're likely headed up into next week.. sp'2000 looks a relatively easy target. *I remain long-APPL from the $110s. Its not my ideal entry (I was hesitant in the opening hour).. but it should suffice for a good gain within the next few days. 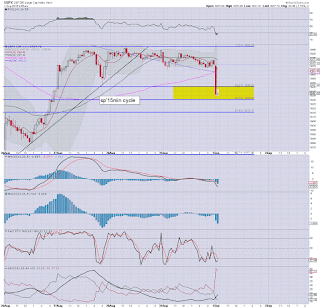 12.36pm... fractional new intra low.... sp'1925... but VIX still not above the opening high. I am not rattled... with AAPL 110.50s. US equities have seen a morning floor of sp'1925 - with VIX having maxed at the open @ 31.95. A natural retrace of last weeks three day hyper ramp of 126pts has likely been completed. It would seem just a matter of time for when we'll break to new bounce highs (>1993).. which is possible before the Friday close. *VIX has been unable to break the opening high... and both the 15/60min cycles are both on the high cycle. A daily close in the 27/26s look possible. So... a fair bit of price chop.. and all things considered, we've probably see the retrace play out as expected. I would only be surprised on any break under the 1900 threshold.. and frankly.. that seems highly unlikely. Yours truly is once again Long-AAPL, from the $110s. Seeking the 115s. US equities open significantly lower, with an early low of sp'1931. 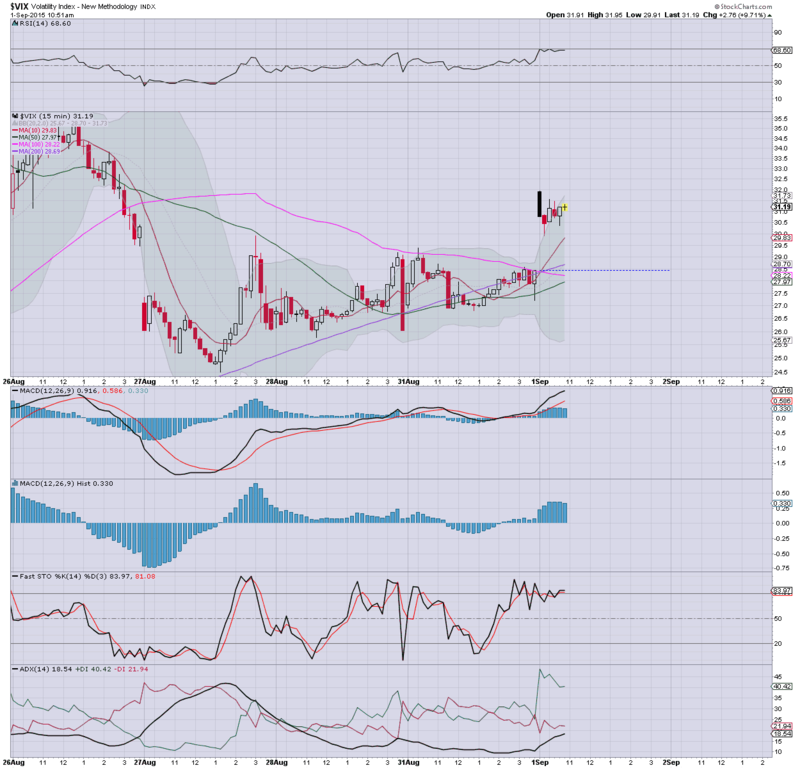 There is a notable black-fail candle on the VIX, having opened at 31.95.. but already rapidly cooling back under the 30 threshold. Broadly, the market should form a floor across the next few hours.. before resuming the climb from last weeks low of 1867. 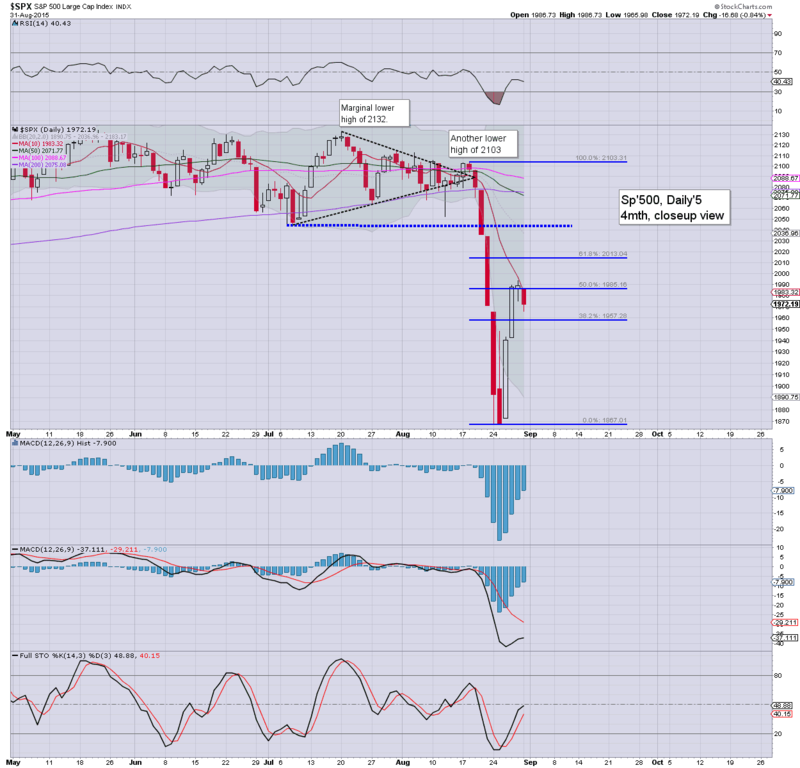 Black-fail candles are not to be dismissed lightly.. and frankly, equity bears should be very concerned that we already have seen a full retrace of the 126pt ramp from last week. *I remain on the sidelines.. eyes on AAPL, but it has already bounced into the 111s, and I ain't particularly interested in getting involved before 11am. Right in the target zone. 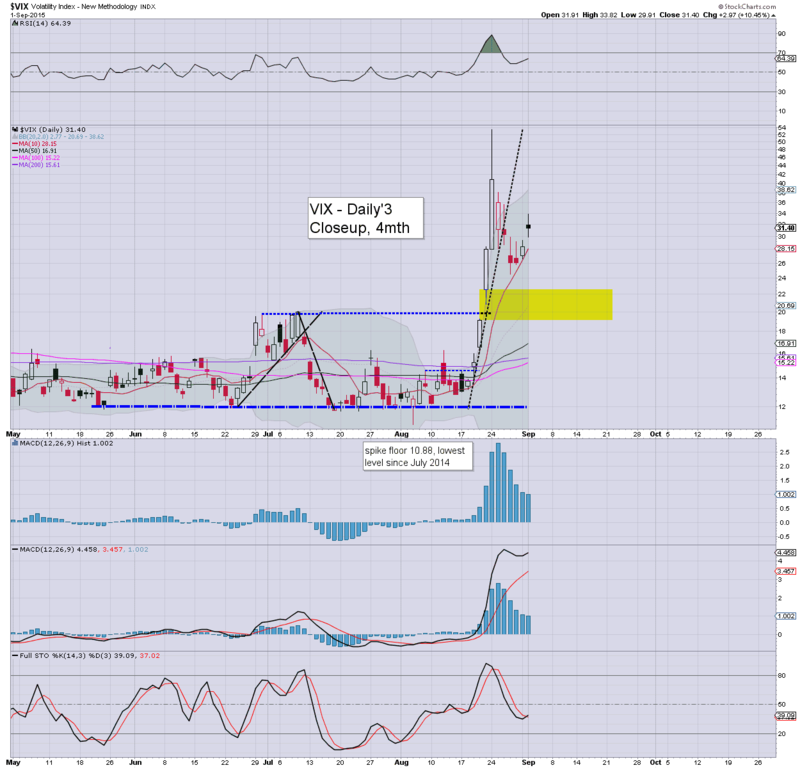 10.06am.. VIX back on the rise... trying to break new highs. *yours truly has close eyes on AAPL... 110.70s. 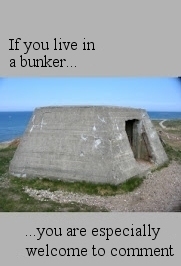 10.31am.. It looks like we have a retrace low of sp'1925.... and we're already at 1936.. with relatively easy upside to 1950. Good morning and welcome to September. Equity futures are sharply lower, sp -40pts, we're set to open around 1932. It will be critical for the bulls to hold the market above the 1900 threshold, otherwise things could unravel all the way to the Oct'2014 low of 1820. As I noted last Friday, equities are due a retrace of the 126pt ramp from the double floor of 1867, Target zone was 1945/30... and we're set to open at the lower end. 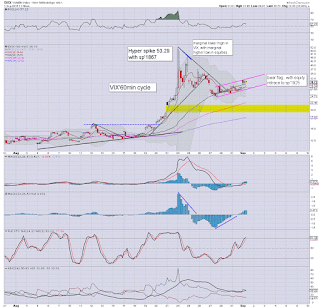 NFLX -4.4% @ $110.00... precisely on target... at the gap. 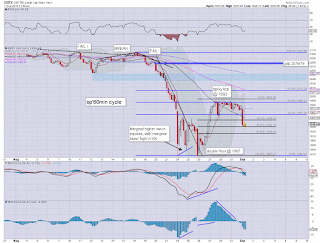 *I will strongly consider picking AAPL-long today, especially around 11am, in the 109/108s. I'll also consider DIS-long from the 99/98s... if price action looks okay. I do understand why some are calling for much lower levels in the near term, but the daily MACD cycles are already on the VERY low side... and frankly, it makes for a lousy place to be short. I'm holding to a no-shorts policy until FOMC week. One thing is for sure... today won't be dull... but then with VIX in the 30s.... why would anyone be surprised? Overnight China action: Shanghai comp' settled -1.2% @ 3166. Good wishes for Tuesday trading. 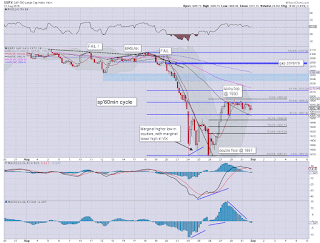 8.58am... sp -52pts.. we're set to open at 1920... significantly below my target zone. Its getting somewhat borderline for the bull maniacs. 9.40am.. opening black-fail candle on the VIX.... bears beware. It was a mighty bearish month for the US and most world equity markets. 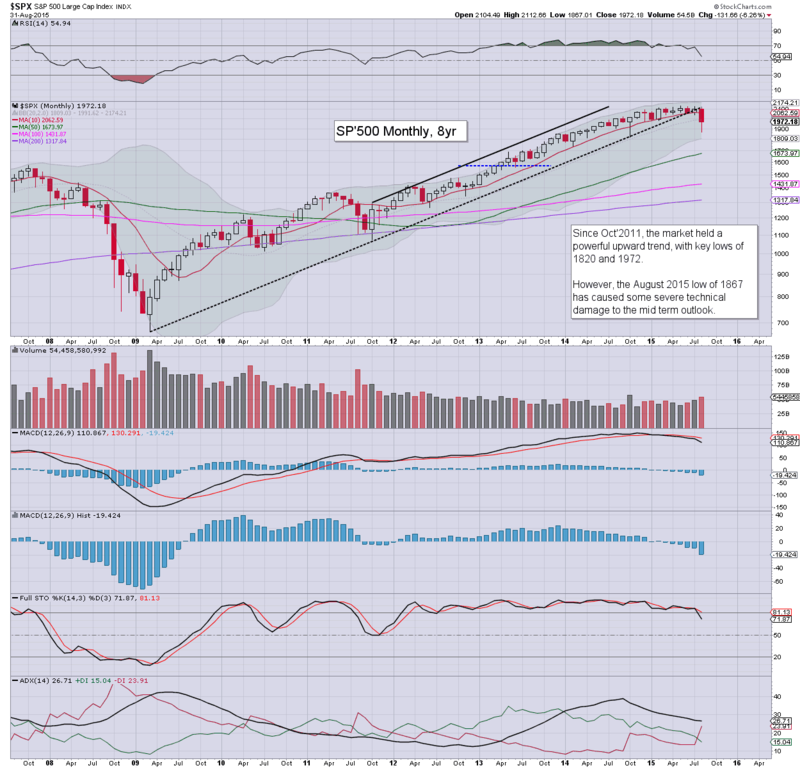 The sp'500 saw a net monthly decline of -6.3% @ 1972 (intra low 1867), with the Dow -1161pts (-6.6%) @ 16528. 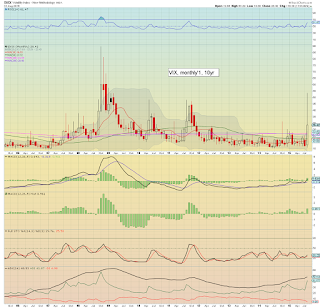 The VIX saw an incredible net monthly gain of 134.5%, having hit a Monday equity flash-crash spike of 53.29. 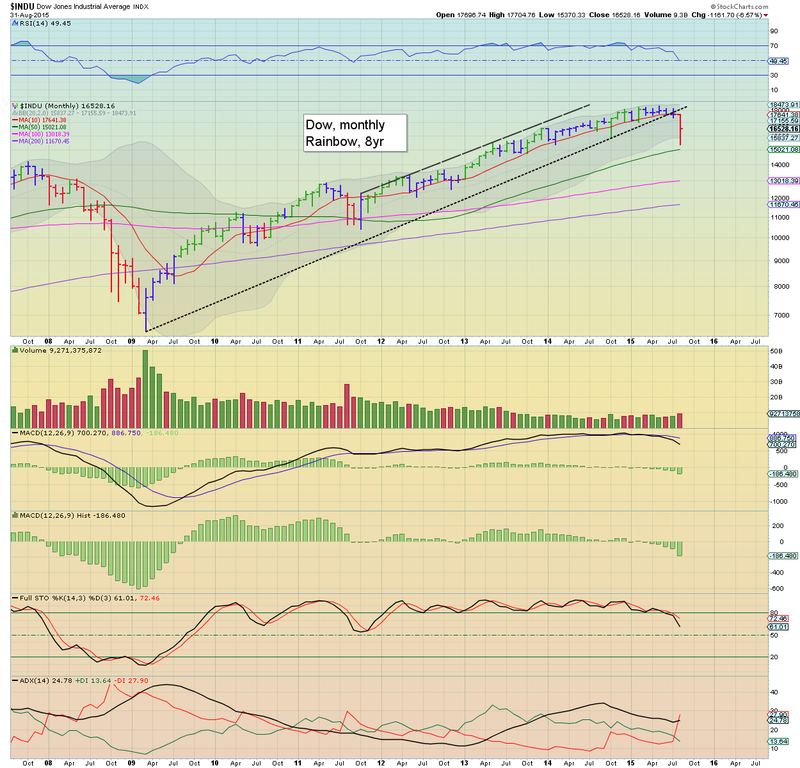 We have a clean break of the broader upward trend from 2009. There is serious technical damage, and the sp'500 looks set to at least test the Oct' 2014 low of 1820 in the next wave.. which itself doesn't look due to start until mid Sept. 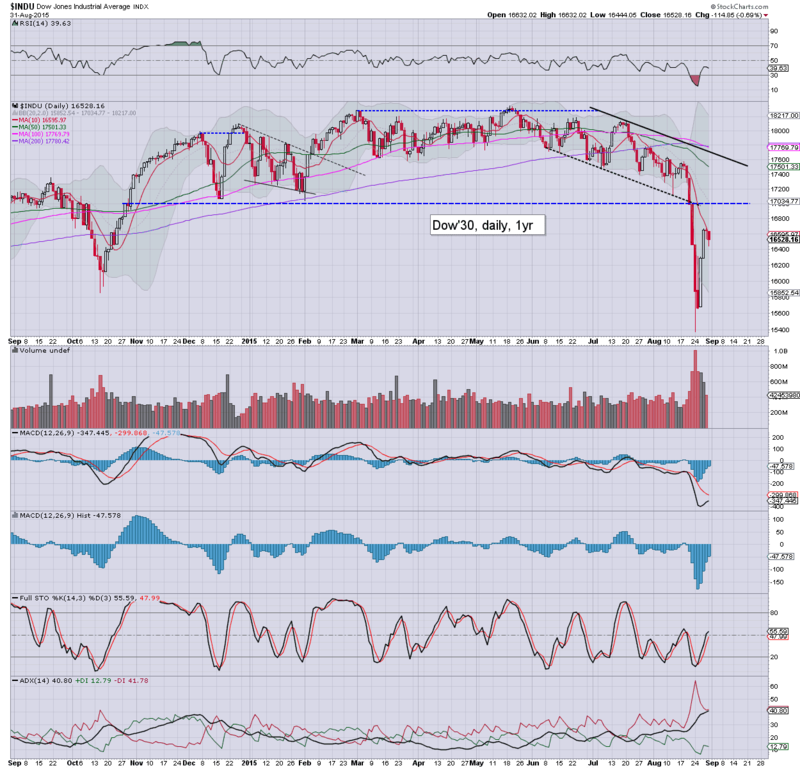 Considering the broader picture, an even more extreme drop to the low 1700s looks possible. 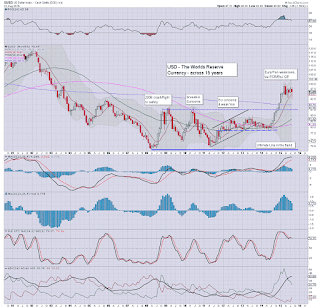 The monthly 'rainbow' chart saw the first settling red candle since Sept' 2011. With the Dow already piercing the lower monthly bollinger (something I did not expect), the outlook remains bearish at least into early October. 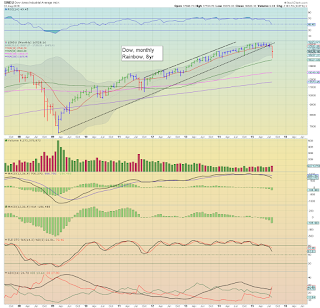 The mid May high of 18351 will probably not be challenged in the remainder of this year. 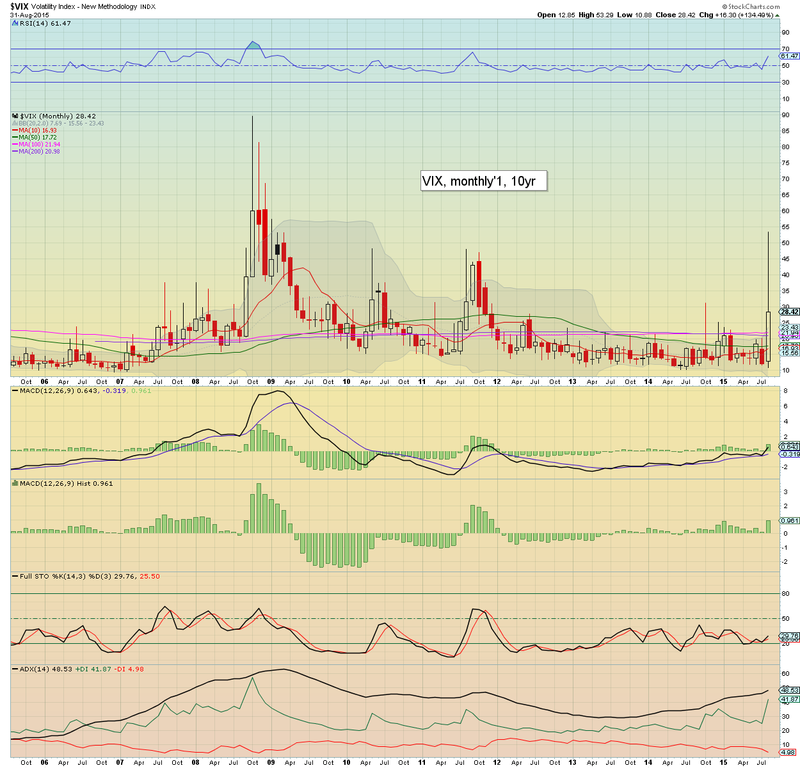 I rarely highlight the VIX monthly, but it is highly notable that we saw the VIX reach heights last seen in Jan' 2009. 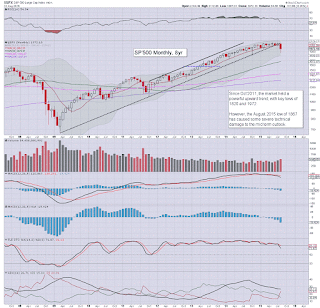 If the market does unravel to the low sp'1700s in October, that might equate to VIX in the 60s.. or even 70s. 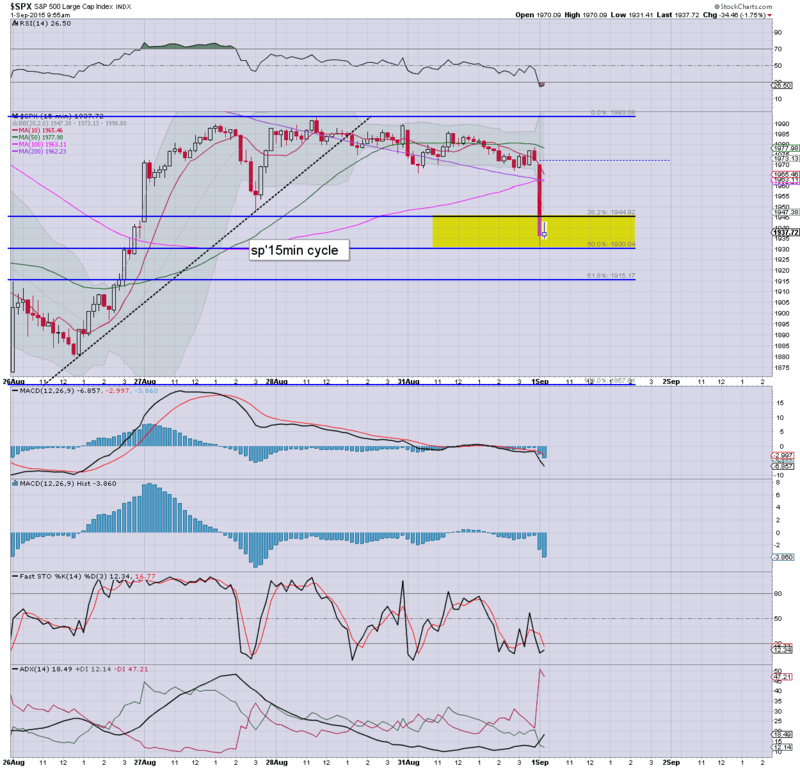 A net August decline of -1.6% @ DXY 95.89, however, this was significantly above the intra low of 92.52. Indeed, we have another monthly candle with a rather clear spike floor. 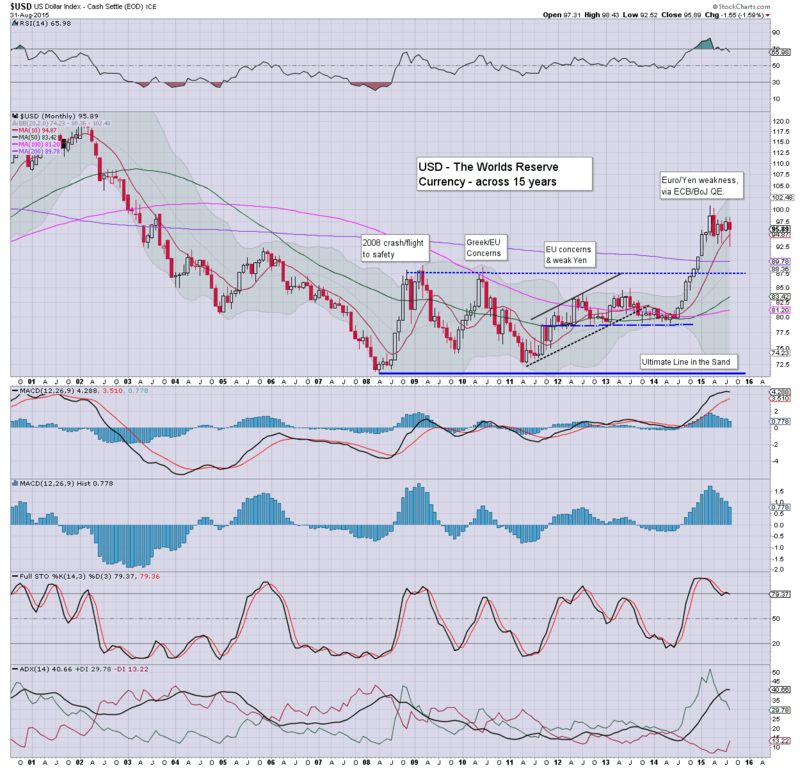 The USD looks set to break back above the giant 100 threshold.. and from there.. the 120s will be due. Despite a great deal of intervention, the Shanghai comp' saw the third consecutive net monthly decline, settling -12.5% @ 3205 (intra low 2850). With a monthly close below the old breakout threshold in the 3400s, the SSEC is in real trouble of a complete implosion back to the starting point from summer 2014 @ 2k. Indeed, if most world equity markets see renewed trouble in late Sept/Oct', then the China market will very likely be trading somewhere in the 2500/2000 zone. No doubt the communist leadership will be furious at the ongoing selling, and rather than just continued threats against the 'malicious short sellers', maybe we'll soon starting seeing press reports of execution by firing squad. After all... the bears were responsible for the equity bubble pop, right? Ohh, and don't forget the ghost cities too. Yes, those bears are clearly the underlying cause of a great many economic problems. 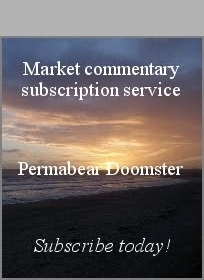 *Fed official Rosengren will speak on the economic outlook around 1pm... and Mr Market will be listening. Today likely saw the first part of a retrace of the 126pt ramp... target is 1945/30... which seems probable within the next few days. All things considered, renewed upside into mid Sept' looks due, as high as the 2050/70 zone. 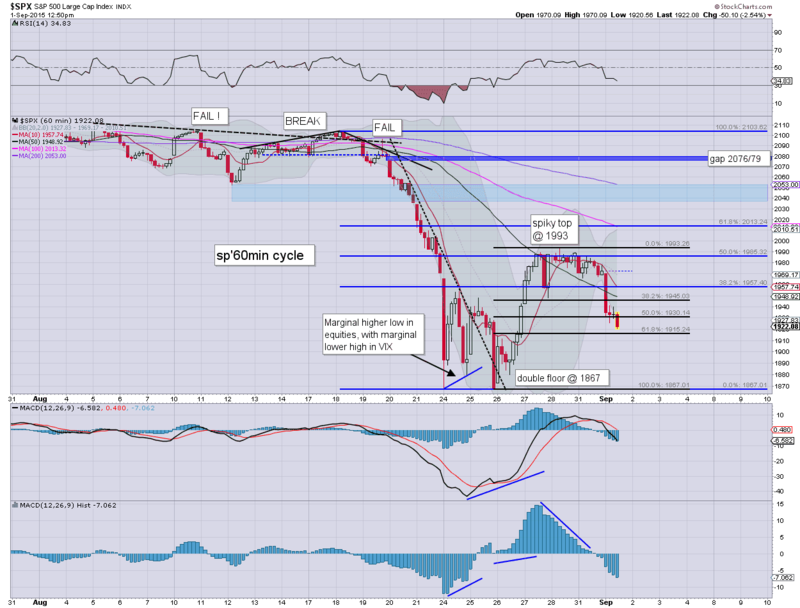 I do not see sustained price action above sp'2080 as viable.